Turkey - 50 old stamps - Value ? 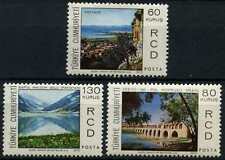 Timbres de TURQUIE . (Neufs < 20 % de la Cote Yvert, Oblitérés < 12 % de la Cote Yvert - sauf exceptions). Neufs charniérés et. à des Conditions Très Raisonnables. Unmounted mint block, MNH, very good condition, full gum, no toning, see my others. See scan for exact item(s)and exact condition. Türkei, guter Bestand mit viel Altmaterial !!! Francaise Militaire Occupation Cilicie. Turkey Revenue. Here are the details for this lot. Scott#: 1492a. I take care of your products and try to describe them as well as I can. My after sales service will take care and solve the problem as soon as possible. Ottomon / Turkey. 20 Paras stamp. Circa 1914. Più conveniente altrove?. FACCI SAPERE! 1938 Turkey SG 1201-1210. Izmir Fair. Set of 10. 1937 Turkey SG 1192-1195. 2nd Turkish History Conference. Set of 4 M/M. Selection of early average to Veryfine all used one or two mint. ADANA n°6 (Anatolia) bilingual cancel. PORT DANS LE MONDE ENTIER. Registered cover, Turkey to UK, Istanbul postmark 17 8 1930. Cairo receiver dated 12 June 1892. NH for never hinged, LH lightly hinged, VLH very lightly hinged, OG for anything more than lightly hinged. If the stamp was issued with gum but has lost it, I will list it as Unused NG for no gum. CANDIA (Crete, Greece) arabic script double octogone cancel - (Coles & Walker type AO2). Timbre Oblitéré, dents courtes sinon oblitération TB / Short perfs, otherwise Very Fine Cancel / Kurze Zähne, sonst sehr schöner Stempel. US Funds Only ~~~~~~~~~~~~~~~~~~~~~~~~~~~~~~~~~~~~~~~~~~~~~~~~~~~~~~~~~~~~~~~~~~. ~~~~~~~~~~~~~~~~~~~~~~~~~~~~~~~~~~~~~~~~~~~~~~~~~~~~~~~~~~~~~~~~~~~~~~~~~~~~. No foreign currency. (Due to high fees). TURKEY 558 MINT HINGED OG * NO FAULTS EXTRA FINE !